This article applies to Firefox and SeaMonkey. The Firefox Search Bar is a convenient way to search using your favorite search engines. Firefox comes with a set of pre-installed or "default" search engines which are available to all user profiles. The default search engine is Google. 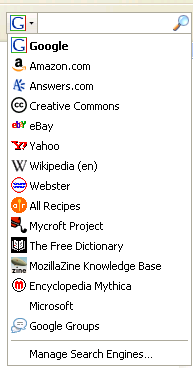 Other available search engines are accessible from the Search Bar drop-down menu. To search, click in the Search Bar (or press "Ctrl+K") and start typing. Press the "Enter" key or, in Firefox 2 and above, use the "search" button and your search will be run. You can use "Alt+Enter" to open search results in a new tab. The Search Bar supports more than one search engine. To see the list of available engines click the icon at the left of the bar, and a list showing the available search engines will appear. You can also use "Ctrl+Up"/"Ctrl+Down" to cycle between the available choices. The selected search engine will be displayed in boldface within the list, and will be the search engine used from the search box. The selected search engine is also the search engine used when you choose words in the body and use right-click you will be offered a context menu item to use the selected engine to search for the selected words. For example – Search Google for "selected words". Starting in Firefox 2, you can reorder or remove entries from the list of search engines in the Search Bar by selecting "Manage Search Engines...", located at the end of the list of search engines. An easier way of adding individual search engines as needed is with the Add to Search Bar extension by right-clicking within the search form on a web page and using the "Add to Search Bar..". Another method of using a search later is to create a keyword shortcut for the search by right-clicking within the search form on a web page to create the shortcut with built-in context menu item "Add a keyword for this Search...". You can uninstall search plugins you don't want in Firefox by opening the "Manage Search Engines" search engine manager. In the list of installed search engines, simply select the unwanted engine and click the Remove button. 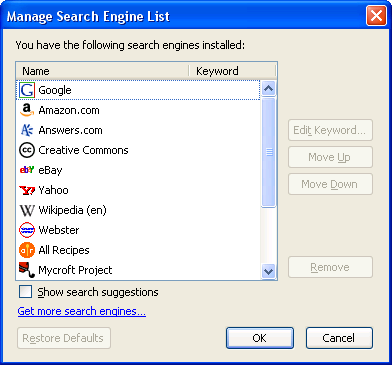 Default search engines that come pre-installed in Firefox currently include Google, Yahoo, Bing, Amazon.com, eBay, Twitter, and Wikipedia (previous Firefox versions used to include Answers.com and Creative Commons). If you have removed any of the default search engines. you can restore them using the "Manage Search Engines "Restore Defaults" button. This will not remove any added search engines. (If the "Restore Defaults" button is disabled or "grayed-out", as shown above, that means that all of the default search engines are still available). Another way you can restore the default set of search engines is to use the Firefox Safe Mode option, Restore default search engines. This will add back all of the default search engines if some of them are missing. This will not remove any added search engines. You can clear the previous searches from the Search Bar. Just right-click the text area of the Search Bar to open the context menu and select "Clear Search History". If "Clear Search History" is grayed out then the search history is already empty. You can delete individual elements by selecting them and pressing the "Delete" key. See article, Deleting autocomplete entries for more information. Note that search "Suggestions" are not your search history but are loaded in real-time by querying the Google search engine site based on what you've typed so far in the Search Bar. If you don't want to see these suggested search terms, the last item in the Search Bar context menu is "Show Suggestions" and has a checkmark if that option is enabled. Select it to toggle that option. You can also click the Google icon in the Search Bar to open "Manage Search Engines". You will see a "Show search suggestions" checkbox at the bottom of that window. There is a way to turn Safesearch off in the Google search plugin without setting preference cookies. Simply go to the Firefox installation directory, open up the "searchplugins" folder, open the "google.src" file in a text editor like Notepad and add <input name="safe" value="off"> between <input name="oe" value="utf-8"> and <interpret browserResultType="result">. Then save the file and restart Firefox. To turn off filtering for Yahoo, go to the Firefox installation directory and open the "searchplugins" folder. Then open up the "yahoo.src" file in Notepad or a similar text editor. Add <input name="vm" value="i"> after <input name="ei" value="UTF-8">. Save and restart Firefox. Search suggestions at Firefox Support, note difference between suggestions and AutoComplete. Add to Search Bar extension for Firefox 2.0 and up, Make any pages' search functionality available in the Search Bar, or as a keyword shortcut. Mycroft search plugin project provides a collection of Sherlock & OpenSearch Search Engine Plugins (12718 at the last count) for your web browser.